Research indicates that there are two specific kinds of aging: aging created by genes we inherit (intrinsic) and aging caused due to environmental factors, such as exposure to the sun’s rays (extrinsic). Our patients as well as our staff have been raving about EltaMD Sun Care in order to protect their skin from the brutal sun, especially in Arizona. Ultraviolet (UV) rays are components of the invisible energy that comes from the sun. UVA (aging) rays account for 95% of our sun exposure. These rays create skin aging and contribute to skin cancer. UVA rays sneak into the skin layers, harming collagen and cells, which leads to wrinkling, hyperpigmentation and loss of elasticity. UVB (burning) rays typically affect the outer layer of the skin. 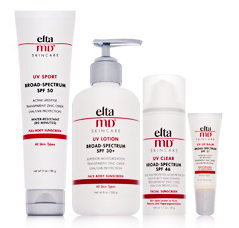 EltaMD Sun Care products provide a variety of sunscreens that prevent sun damage safely and supply true broad-spectrum UVA and UVB protection. All of the products are composed of microfine transparent zinc oxide and are noncomedogenic, sensitivity-free, fragrance-free and paraben-free. The products range from facial and body sunscreens from SPF 30 to 50 and each product is tailored to certain skin types such as those prone to acne, rosacea and hyperpigmentation. Dermatologists have discovered that the most powerful cosmeceutical that can prevent and reverse the signs of aging is sunscreen. All of the EltaMD Sun Care products can help put a stop to signs of premature aging and protect against sun-related skin diseases when used daily. Contact the SHAW Center at (480) 767-1900 to find out more about the EltaMD Sun Care products that we carry!